This pattern is posted in recognition of National Wear Red Day. National Wear Red Day, February 6, 2009, is a day when Americans nationwide will wear red to show their support for women's heart disease awareness. This observance promotes the Red Dress symbol and provides an opportunity for everyone to unite in this life-saving awareness movement by showing off a favorite red dress, shirt, or tie, or Red Dress Pin. 1. Read instructions through before beginning. 2. If your stitch count isn't exactly pattern, don't worry about it. Ch 18, join with slipstitch in first ch to form ring. Round 3: Ch 1, 2 hdc in same st as join, *hdc, 2 hdc. Repeat from * twice. Skip 11 sts, 2 hdc, *hdc, 2 hdc. Repeat from * twice. Skip 11 sts, join with slipstitch in top of first hdc. (22 sts). Choose the side you think looks best for the front and glue heart to left bodice. Glue or sew pin back to back of dress. Suzie - that is so beautiful!!! I can't wait to make one and wear it on the 6th and there after! Thank you!!! Very nice, though I've never heard of National wear Red Day. Thanks for enlightening me. Thanks for reminding us Suzie. 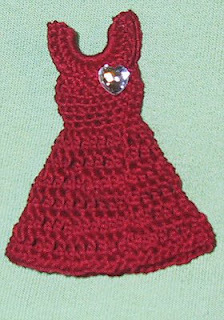 Especially with such a cute 'Red Dress' pin! THANK YOU SO MUCH IT IS JUST BEAUTIFUL!! I'M GOING TO MAKE A BUNCH FOR MY WORK FRIENDS!!!! THANK YOU! Pretty! Very generous of you to share. I am going to wear one of your lovely Valentine tiny hearts from last year, though. :=) That one I have made for friends. Beautiful. Thank you for all of your designs. This is really cute! I think I will throw some purple in there somewhere & make one for my mom & her red hat ladies! Thank you for sharing all of your patterns. This one looks like fun to make and share. Thank you for your pattern. Needed to let you know that I make these every year and donate proceeds to the American Heart Association. Thankvyou, again. Thank you for this pattern. I've made these for the past two years. Letting you know proceeds go to the American Heart Association. Thanks for this pattern! I can't wait to make some for my coworkers as well as myself! !